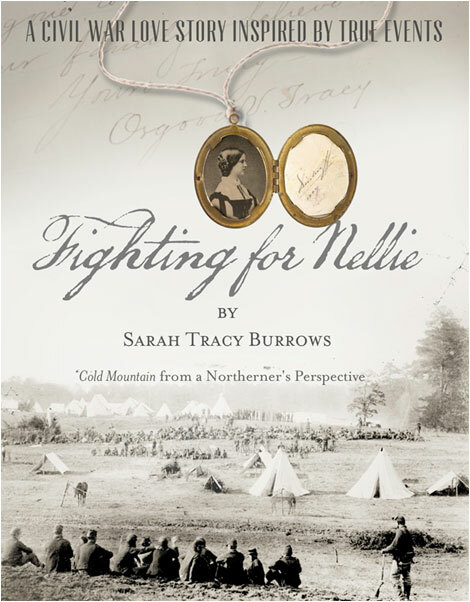 In August 1862 during the darkest days of the American Civil War, Osgood Tracy volunteers to fight for the North, leaving behind the love of his life, Nellie Sedgwick, for the front lines. There, the twenty-two year old idealistic young man discovers a baptism of fire and alongside comrades he’d give his life for, endures a physical and emotional journey back, all the while hoping Nellie, whose photograph and love he carries with him, embraces him at the end. On the home front, though, Nellie fights her own battles. Fraught with family calamity, guilt, and courtships, she dutifully represents the Union, first at home in Syracuse, New York then Washington, D.C., as she struggles with a decision that may haunt her forever. 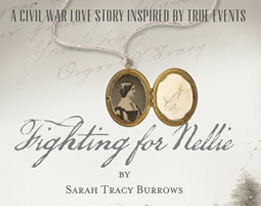 A historical novel based upon one of the largest private letter caches in the country, written by a direct descendant, FIGHTING FOR NELLIE is a page-turning story swirling with passion and jealousy, abolitionists and slave owners, politicians, war heroes, and rebels, and the quest for undying love. A story demonstrating that life can change in an instant, war alters everything, and we must fight for what we love, FIGHTING FOR NELLIE will remind readers of Cold Mountain from a Northerner’s perspective and a contemporary All Quiet on the Western Front. Passionate about reading and writing since a young girl and inspired by true stories and memorabilia handed down by my beloved grandfather, I write historical and current fiction based on true events, as well as nonfiction and poetry. For me, writing is one of the ultimate ways to express my self, experiences, and what inspires my soul, such as acts of kindness, courage, and stamping out individual and social injustices. A native of Central New York and graduate of Hobart & William Smith Colleges with a B.A. in English and history, I worked for many years at a Boston publishing company in editing, sales and marketing. 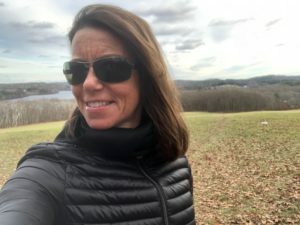 I live on that city’s North Shore with my family — am proud of our three sons’ — and Golden Retriever, Scout, a ‘pathfinder.’ My passions besides writing, family, and friends include photography, music, running, swimming, skiing, walking nearby beaches, the Adirondack Mountains, and watching every sunrise and sunset possible. On National Women’s Day, I reflected on the courage of women, in general, and in my ancestry, how each was, in their own way and circumstances, courageous and impactful. 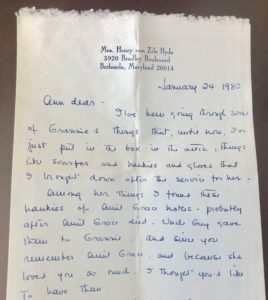 As an example, in this note written by my great grandmother, Florida “Flo” Bayard Seay Tracy, to my mother, Ann, for her wedding, “GrannieTracy” passed along “something old” – a handkerchief belonging to my 4th great grandmother, making the fabric today @160+ years old – and asked my mother to one day give it to the next bride. 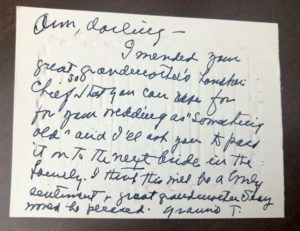 The second note, also written to my mother, was from Grannie’s daughter, Ellen,(“Aunt Ellie”) both women who I knew and loved. Their notes are reminders of the bonds women share and the courage, support, and love they can hold and spread, to themselves, families, communities, and generations following. 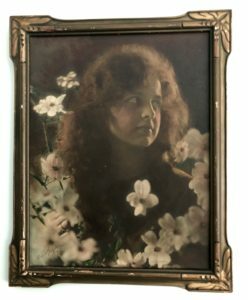 “Grannie Tracy,” born in 1880 in Rome, Georgia, was brave in many ways, one being to live outspokenly in a world she couldn’t hear. Though deaf since her early twenties, she communicated as well as anyone I knew. She read lips and spoke eloquently. She stated, jokingly, that she often learned more from a church sermon than people who could hear it. Her choice word, “darling,” and her gentile, graceful manner yet strong sense of feminism I can still hear and feel today. Grannie Tracy was also brave when, after graduating from Shorter College in Rome, majoring and excelling in music, she called off her engagement to a local man to marry her true love, my great grandfather, James Grant Tracy, who she met at Cornell University while visiting a girl friend, a Cornell student. 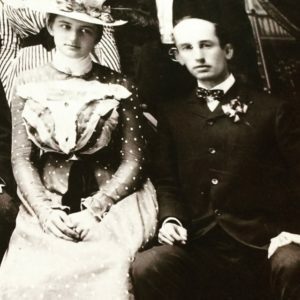 Eventually moving from her native Southern state, she settled with James in Syracuse, New York. 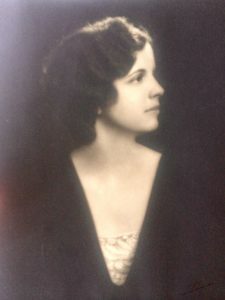 An outstanding writer, historian, and genealogist, who consistently and exhaustively tried getting her work published, her short stories speak vividly of her childhood as the daughter of Rome’s mayor (John Seay), owner of the Coosa River Boats Company, veteran of the Civil War (as were her two older brothers), and the strong woman who raised her. 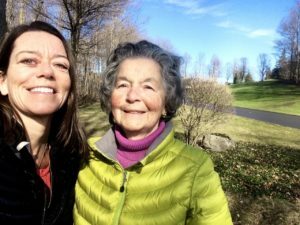 One of Flo’s stories explains the loss of the family’s largest boat, by flood, recalling her father’s discouragement upon returning home after learning the news but her mother’s resiliency springing into action to get him and the family right back on their feet. Ironically, years earlier, while Grannie’s father and brothers fought for the Confederacy, her future husband James’s father and uncle (Colonel Osgood Tracy and Confederate Medal of Honor recipient, Major William Tracy respectively, 122nd NYSV) fought for the Union, leaving at home their widowed mother, my 3rd great grandmother, Sarah Vose Osgood Tracy. Grannie herself would one day see her youngest, son, Ted, serve in WWII, landing on Iwo Jima day two. 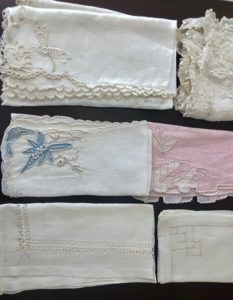 No doubt Grannie kept these handkerchiefs close at hand during those years. 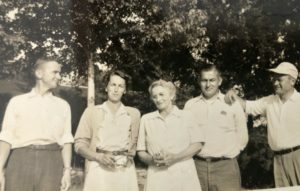 After the death of her husband, Sarah raised four sons’ as a single parent, losing the youngest at age 6 to Diptheria, the same year James died. Sarah required James Jr., Osgood and Will to study and work hard, and they grew to be responsible, young men. 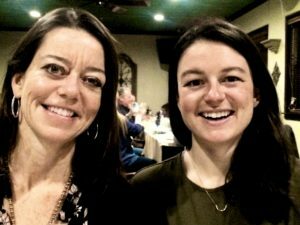 Sarah was, as recalled in letters and her obituary, a conversationalist with a sharp memory and well liked by younger generations. 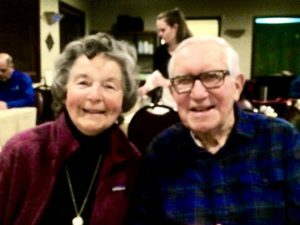 Both an “outdoorswoman” and “excellent horsewoman,” at age 97, six weeks before her death, Sarah rode her two favorite horses some distance herself. Throughout her life, she was passionate about flowers, especially exotic European ones. 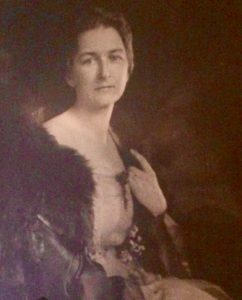 Sarah’s daughter-in-law, (my second great grandmother) Ellen “Nellie” Sedgwick Tracy – whose stepmother was Women’s Suffragist, author, and abolitionist, Deborah Gannett Sedgwick, of Boston – made an impact, too, in the lives of women. 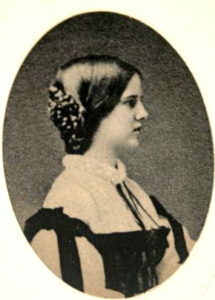 In her early twenties, she spent a great deal of time in Washington, engaging her interests in the abolition movement. Her father, two term N.Y. State Representative Charles Baldwin Sedgwick, was a staunch abolitionist, who refused to leave Congress until every slave in every state was free. (He was first to give a speech on the House floor in 1860 denouncing slavery, and years earlier represented white men whom freed from jail an enslaved runaway man who had been imprisoned). Though Nellie herself did not serve in Congress, as women were not allowed, she was alongside her father in the city, House and at the Naval Academy, for which he codified laws. She assisted the war effort in helping to raise funds for a new Navy vessel, the USS Onondaga. And on January 31, 1865, Nellie sat beside her father in the House when the Thirteenth Amendment to the United States Constitution passed in the House abolishing slavery and involuntary slavery. Circling back closer generations, my mother, Ann Livingston Tracy Burrows, the most important woman in my life who I will miss and honor each day I live, hopefully instilling the valuable lessons she taught me in my life and three sons’, was a teacher. She supported my father before he could practice law, and though not financially after that, in all ways until the day she died. 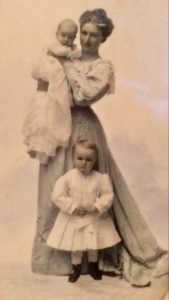 My father’s mother, Gertrude, my “Nan,” oversaw a maternity ward, delivering and taking care of babies at both the hospital and at home. She taught me at an early age to enjoy baking, and being a breast cancer survivor, that women sometimes must lose their breast(s) in order to save their lives. My maternal grandmother, Loretta, (below) I never had the chance to know, but I don’t doubt she was brave. She married Granny Tracy’s youngest and fourth child, John Bayard Tracy, and raised their three children during the Depression while my grandfather, who graduated from Cornell University, worked night shifts shoveling coal into furnaces at Crucible Steel and in time off and other periods, coffee into bags for the O.V. Tracy Coffee & Co. family business founded one generation before. 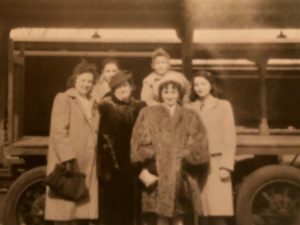 My grandmother, mother, her brothers, cousins and friends helped, too, with the company. In 1962, during the Cold War, Loretta suffered a parent’s worst nightmare; her youngest child, “Johnny,” age 25, was killed while co-piloting a Secret Air Command mission back from Russia. After the Air Force messenger delivered a telegram to my grandparents’ front doorstep, I imagine these handkerchiefs were put to use all too well. The loss must have been difficult, to say the least, on my mother, especially being 8 months pregnant (with my brother, John). 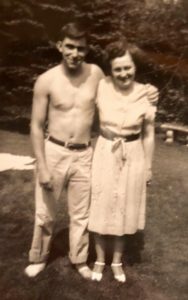 And four and a half years after (17 months before I was born) at the age of 61, my grandmother died, after a battle with alcohol, which perhaps she thought might ease her pain. Though she lost that fight, in my eyes, she was a courageous and beautiful woman. 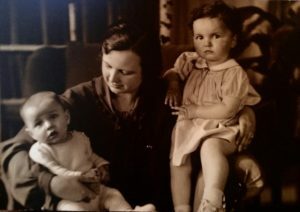 The above stories are a small window into four generations’ of women in my family, colored like stain glass before me. I am grateful for the love, courage, and example these women passed on. I think often on the hardships and strength many of them must have had watching sons serve in wartime and the military. I think, too, about the love I feel for women relatives today, such as my Aunt Barb, and Betty, my cousins, Dawn, Sharon, Whitney, and second cousins, Tracy and Julie, my four sister-in-laws, mother-in-law, four nieces, and my cousin’s wife, Toma, my mother and father’s cousins’ etc. still with us today. 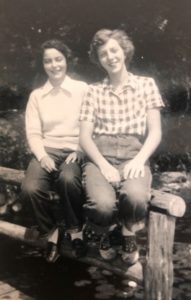 And those second aunts to me, sisters of my grandmothers’ and great grandmothers’ who were so wonderful in each of their own ways. I loved the gatherings we had. 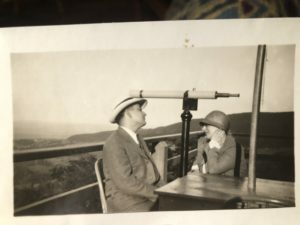 I am grateful, as well, for women friends and neighbors, many of who are like family, and a woman who is like a second mother to me, Sue Beeching. In closing, cheers to women everywhere who are “fighting the fight,” whatever battle and/or dream it is, trying to make a difference in themselves and others, and helping educate those following their lead. Though my mother, grandmothers, great grandmothers and great aunts are no longer here on Earth they are and will always be women who are very much with me. 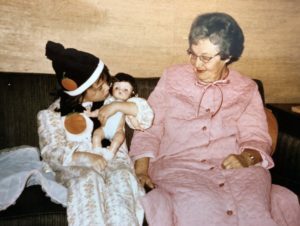 I dedicate this story to my beloved Grannie Tracy, Aunt Ellie, and my mother. I am grateful for the amazing women they were and the lessons theytaught. Granny Tracy is especially with me when I write. One day, I plan to publish her stories, for her, and of course, look forward to passing on the handkerchief! 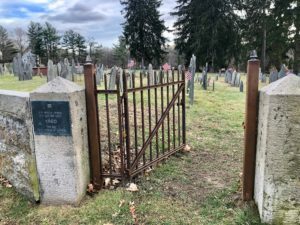 On a cold, clear, windy, late November day last week, I visited Andover, Massachusetts, where, during the ‘Great Delusion of 1692,’ forty-five women and men residents were accused of being ‘witches,’ arrested and imprisoned, including my 8th great grandmother, Mary Clements Osgood. Since a young girl, I enjoy walking awhile in the paths my ancestors’ and their friends, and ‘enemies’, traveled. Mary’s is certainly one, but I find many stories interesting, and connected, branching from one to the other. With the aid of preserved letters, documents, photographs, paintings, and other historical information, I travel back in time, so to speak, acquiring knowledge about what they endured, enjoyed, where and how they lived, traveled, and whom they loved. In many ways, to me, learning about them is like doing a puzzle, playing a detective game. The end result – the prize – a window into the past, often colorful, like stained glass. In Andover, more women and men were accused and arrested under the idea that they were ‘witches’ than in either the town or village of Salem, yet on that day, I didn’t go to Andover thinking of them or Mary. But as is often the case, one track led to another. Rather, I was thinking of Mary’s husband, my 8th great grandfather, Captain John Osgood, born in Wherwell, Hampshire, England in 1631. John Osgood built his home on the banks of the river, today at the junction of Osgood and Court Streets. 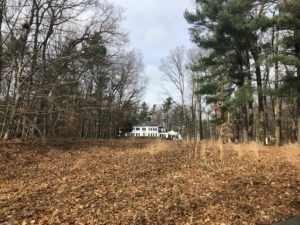 He came to own 600+ acres of land, in what now is North Andover. His barn, on the east side of Osgood Street, still stands, along with his second home, on the National Register of Historic Places. 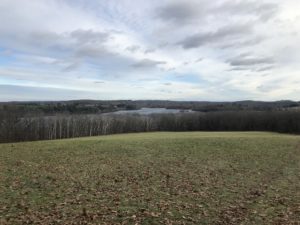 Surrounding both is land he called “Great Wide Meadow,” as referred to in 1690s’ deeds, including a long, sweeping hill then called ‘Weir Hill’ with views of the valley and the lake. 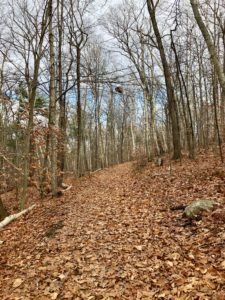 Of recent, hill is named Osgood Hill, now public paths and wooded areas for all to enjoy and roam. 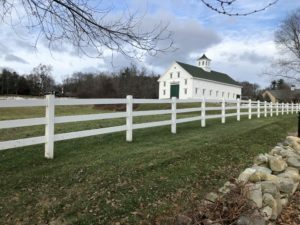 Edgewood, An Independent and Life Care Community, sits on 100 acres of John’s original land (including John’s original 1600’s barn and original house, now a guest house for visiting families) with Osgood first names marking street signs and mailboxes. Finding out about John, I then wanted to know more about Mary. Born in Ansley, Warwickshire, England in 1637, her father was Reverend Robert Clements, a prosperous English wine merchant living at Croft, near Leicester city. During the 1620s and 1630s, Clements owned a fleet of ships which sailed between North America and England. During a shipwreck, his brother, John, lost his life sailing one or as a passenger. When Mary’s mother, Lydia, died in March 1641, when Mary was four, her oldest brother, Job, seems to have traveled to New England, and along with ten others, settled Haverhill, Massachusetts. He soon asked their father to sell his English estate and join him. Clements did, emigrating with four of his eight children, leaving Mary – the youngest – in England, probably with grandparents, and two sons fighting in the English Civil War (they would eventually earn land grants and live in Ireland). At about 5 years of age, Mary re-joined her father, in New England. Reverend Clements remarried in 1645, in Haverhill, and on November 15, 1653, in the same town, performed the marriage ceremony of Mary and the young Captain John Osgood, age 20. Mary was just 16. At age 65, Mary was “examined” in Salem before John Hawthorne and other “Majestie’s Justices.” On September 8, 1692, supposedly after being “brow beaten,” Mary confessed to the incident below, which again, occurred shortly after the birth of her last baby (whether before or after its’ death I do not know yet) and indicted in January 1693. Recanting before Increase Mather, a powerful Puritan clergyman and president of Harvard College, Mary was imprisoned in Salem. Being asked why Mary prefixed a time, and spake of her being baptized in The Great Pond, &c., about twelve years since, she replied and said, that, they asked the time, to which she answered that she knew not the time. But, being told that she did know the time, and must tell the time, and the like, she considered that about twelve years before (when she had her last child) she had a fit of sickness, and was melancholy; and so thought that that time might be as proper a time to mention as any, and accordingly did prefix the said time. Being asked about the cat, in the shape of which she had confessed that the Devil had appeared to her, &c., she replied, that, being told that the Devil had appeared to her, and must needs appear to her, &c. (she being a witch), she at length did own that the Devil had appeared to her; and, being pressed to say in what creature’s shape he appeared, she at length did say that it was in the shape of a cat. Remembering that, some time before her being apprehended, as she went out at her door, she saw a cat, &c.; not as though she any whit suspected the said cat to be the Devil, in the day of it, but because some creature she must mention, and this came into her mind at that time. “Stripings” of many, death awaiting execution, and the public hangings of approximately twenty women took place over a period of time. Specifically regarding Andover, three persons were hung and one Andover woman died before execution. Many of the girls, women, and men (mainly women, yet one girl as young as 4, who was executed) were accused of having “fits,” unable to control their muscles, privately and in public. Since the 1970s those ‘fits’ have believed to have been hallucinations caused by the ingestion of a common grain, poisoned naturally with a fungus; ‘ergot poisoning’ having effects much like that of LSD). After some time, Mr. Dudley Bradstreet, Andover’s Chief Justice, who had issued the warrants and arrest of forty-eight suspected “witches,” finally refused any more. 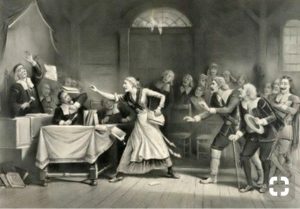 Bradstreet petitioned for the release of Mary and others (after which, and for, he and his wife were themselves accused of being ‘witches,’ and had to flee North Andover for their lives). After four-six months in prison in Salem, Mary was released, with four other women. Bradstreet had, for all his weaknesses previously, saved them. Learning more of Mary’s story, I contemplate her admittance that she experienced ‘melancholy’ after the birth of a child. Today this most certainly would be understood as postpartum depression, thought by many doctors to be caused by a copper overload. 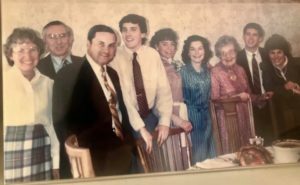 I recall a similar experience myself within 12 hours after the birth of one my three sons’ and Mary birthed twelve, and the time in which she lived was certainly much more difficult for her than for me. Sympathizing with Mary has made me appreciate and understand a bit of the time she lived and imagine what she went through. One of Mary and John’s children – my 7x great grandfather – Lieutenant John Osgood, born 1654, also spent time in prison. 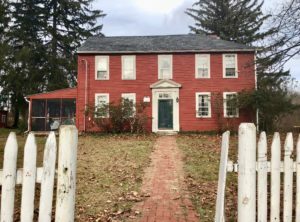 Active in the militia, an inn holder and serving frequently as selectman, he was popular among the townspeople of Andover, mainly due to his opposition of England taxes. He was imprisoned in August or September 1687, five years before Mary was accused of being a witch. Mary and John eventually left him their house, where the first recorded town meeting was held in March 1656. In previous visits to North Andover, I have seen that house, (the guest house at Edgewood). 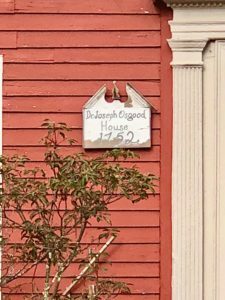 I have also driven by the historical home at 440 Osgood Street, that of Samuel Osgood, who, three generations after Mary and John, was an American Revolutionary War colonel, First United States Postmaster General, and member of Continental Congress. His home housed Harvard’s library during the war against England. A new house I discovered, however, upon this visit to Andover, after being given the address by the executive director at the North Andover Historical Society, was the address of my 5th great grandfather’s house, numbered 815 Osgood Street. 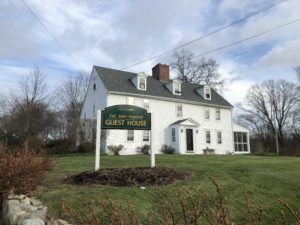 I found the colonial – about a mile from the Colonel John Osgood House. Red in color, a sign to the left of the doorway read “Dr. Joseph Osgood, 1752.” (His father, my 6th gg, another John Osgood, born 1683, Deacon and Lieutenant of Militia, his wife, Hannah Ayres (Osgood) of Haverhill, born 1662). I parked my car in front of the white picket fence, in need of painting, and got out, to stand before the open gate leading up the brick walk to the front door. Though I was disappointed at the unkempt condition of it, being in its presence for the first time felt very special. 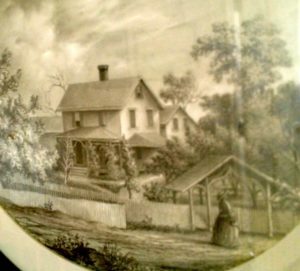 I envisioned my 3rd great grandmother, Sarah Vose Osgood (Tracy) – Dr. Joseph Osgood and wife Margaret’s youngest grandchild – born April 1804, running up the path to the door, anxious to greet her grandparents, and they her. After they opened the door, perhaps they bent down and wrapped their arms about her as they picked her up to a hug, with the aroma of a Sunday supper wafting from the kitchen fire. Standing there at Dr. Joseph Osgood’s house, I had just exited my warm car but not having worn a warm enough jacket, shivered. I contemplated what life must have been like, in the early 1800s. Considering a fall, winter, or spring day and night, and New England weather, the house inside would have have been cold. The family would have gathered around the fireplace (there is one chimney on the house) – talking, reading, studying, playing music etc. Babies would have been born in the bedrooms, died there, too. With no antibiotics, children often did, of diptheria. Joseph and Margaret, like Mary and John, and so many couples, lost numerous children, specifically they lost three sons age @two and one age 14 ten months, the graves of which I would later see that day. 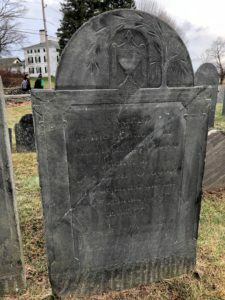 Losing all those children might have been enough to kill my 5th great grand mother (or make her, like Mary Clements Osgood, “the witch,” delusional) but Margaret lived until 1797, to age 78. Fortunately, the third child, born in 1754, another John Osgood, would live to see adulthood and old age. Remnants of what might have been the outhouse was a helpful reminder that there had been no running water and of course, no electricity. I considered what the Osgood father and son doctors must have seen in their lifetimes, practicing generalized medicine in the late 18th and early 19th centuries. They would have visited most homes in town, to doctor babies, children, women, and men for all different reasons including illness, injury, birth and death. Suddenly, bringing me back to the present, was the current owner or renter exiting the back door to his parked car in the driveway (probably wondering who the crazy girl was taking iphone photos). I soon got back in my car but sat a time thinking about how my 3rd great grandmother, Sarah, lived in North Andover until her later twenties when she moved to Syracuse, New York. Sarah left the only home she’d known with her older half sister, Elizabeth Osgood (Putnam) and Elizabeth’s husband, Captain Hiram Putnam of Salem who had been commissioned by the wealthy Boston merchant, Joseph Peabody, to captain ‘The China’ twice around the world trading coffee, tea and spices. He later wrote he felt “ready to get away from the sea.” Ironically, Hiram’s male Putnam ancestors, of Salem, and the Peabody’s, were lead accusers in the witch craft movement. 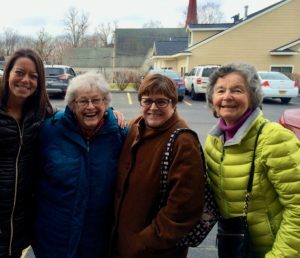 Though Sarah moved away, during her 97 years of life she often reminisced upon her beloved North Andover. Suggesting that, along with many preserved letters, is a poem, below, written for her 93rd birthday by her nephew, George Osgood, giving insight into the beauty of the land and the love the Osgood generations held for it. 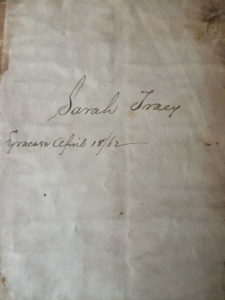 After leaving Massachusetts and arriving in Albany, Sarah met her love, James Grant Tracy, whose father, Captain Jared Tracy of Norwich, CT, was a commissary during the siege of Boston and later fought the enemy at sea. 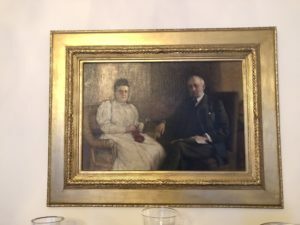 Sarah and James married and resided in Syracuse, where they lived the rest of their lives, though Sarah as a widow when their oldest son, James Grant, was 13. 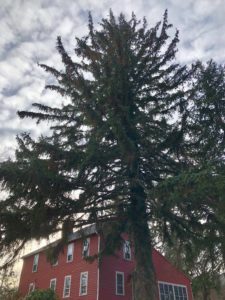 This part of Sarah’s story I am familiar, for I have been engrossed in it my entire life, through letters, stories and memorabilia which my maternal grandfather, John Bayard Tracy, shared with me while I was growing up in Syracuse, in Sedgwick Farm. 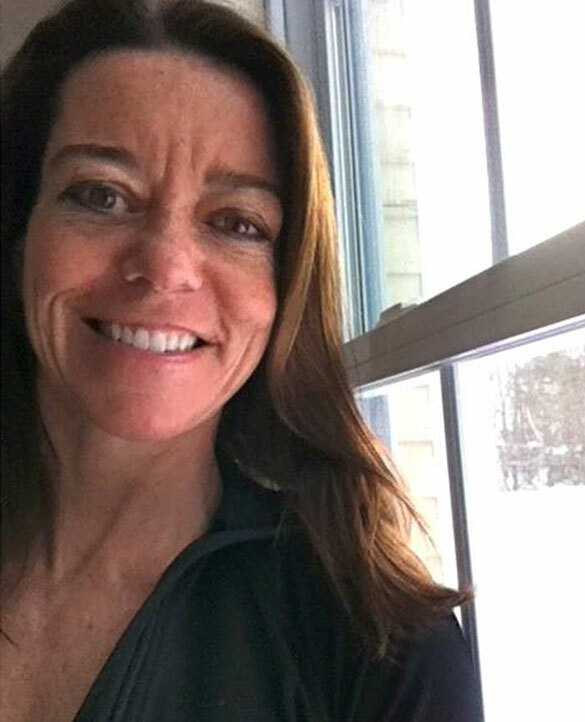 As a single parent, Sarah raised four sons, losing the youngest to diptheria within the same year of her husband’s death. Two of her remaining three sons’, Osgood and William, volunteered to fight in the American Civil War. 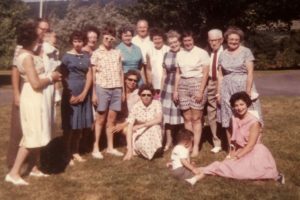 In Syracuse, I knew Osgood’s daughter-in-law, my great grandmother, Florida Bayard Tracy, who lived until I was ten years old. For that reason, to me, as a young girl, the past didn’t seem so long ago. I was amazed that I knew “Granny Tracy” whose father-in-law had fought in the Civil War, then some 110 years before. (Her father, Captain John Seay, and two brothers, fought for the Confederacy, for she’d grown up in Rome, Georgia). At present, I understand better what my grandfather once shared and documents and books indicate. 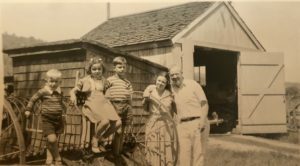 Having lived in Boston now more than half my life – the last 13 years on the North Shore of Boston and a 35-minute drive to Andover and 15 minute drive to where the ship, Confidence, arrived in Ipswich with my Osgood emigrant ancestors -it is part of my journey in adding to the puzzle, walking on and extending the path. 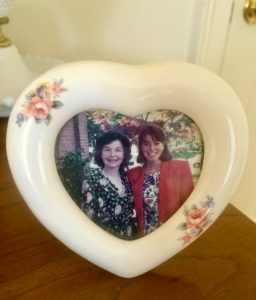 Almost twenty-four years ago, while living in Boston, I chose Andover to shop for and purchase my wedding dress, with my mother by my side. I chose it knowing our family history there, but not to the extent I know now or appreciate. While standing there last week in front of my 5th great grandfather’s house then circling around half of it which I could, I felt full circle, my past tied to my present, and future. 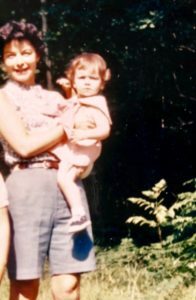 I only wished my mother, who passed this year, could have been with me. When I got back in my car, I cranked up the heat, put the car in drive and headed down Osgood Street, about 1/4 mile. I turned left, winding up a steep hill into the Steven’s Estate at Osgood Hill. At different times during the 1700 and 1800s, Osgood’s and Steven’s married. 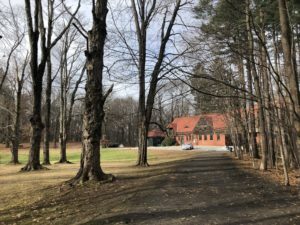 The red brick mansion and grounds are now owned by the Town of N. Andover, used for special functions. Proceeding at the top, by the house, designed by prominent Boston architects and built in 1886 for Moses T. Stevens, an American textile manufacturer and a U.S. Representative from Massachusetts, I parked at the carriage house. 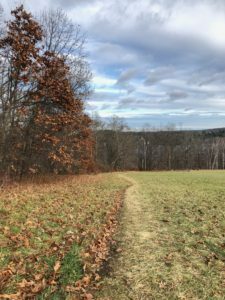 Heading to the trailhead of Osgood Hill, paths extend in three different directions. 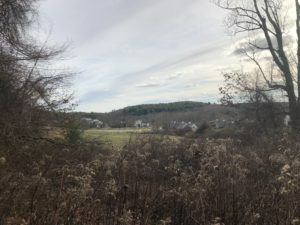 I first walked to the right, to a private drive, at the end of which might sit Sarah’s childhood home, now a private home, with magnificent views overlooking “The Great Meadow” and beyond, to the Colonel John Osgood Guest House and original barn, and Edgewood. Among this path, where generations of Osgood’s roamed, Mary Clements Osgood, accused of and stating under duress, spent time, including that which when she was, as she stated in trial, ‘re-baptized by Satan,’ in its’ water with her friends. I couldn’t help but wonder whether, on a warm, late spring or summer day, Mary and/or they were just having fun, like I might today with my friends and neighbors. 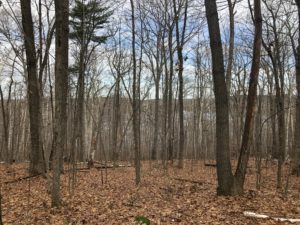 With the majority of the leaves off the trees, a clear view presented through to Lake Cochichewick, “The Great Pond.” White birch trees and Oaks interspersed the woods, standing and covering the ground, causing a lightness and brightness to the dense forest. Original stone walls ran from the top of the Hill from the original estate, now private (at the end of the private drive I’d walked from the first path, perhaps the very house in which Sarah spent her childhood, yet another stone to turn) down toward the lake. 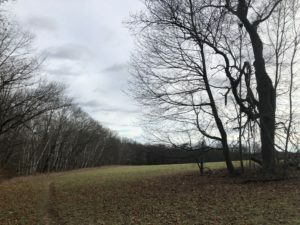 After a ten minute walk, the path opened to the wide lawn of green grass, to Osgood Hill (once Weir Hill) and a breathtaking view of sky and tree line. In my opinion, whether intertwined to this property through ancestors or not, you can not help to take in its natural beauty and feel connection to the land. The wind rattled the dry leaves still clinging to the branches. Hawks circled overhead. Though it was my second walk on Osgood Hill ever, and the second time within this year, it felt more special even than the first. I felt closer to the past, like it was swirling with the brisk air. I followed the worn path amongst the green grass and reached the top of Osgood Hill, looking back from where I came. I took in the panoramic views. The lake in the distance sparkled in the sun, shooting through the clouds. The white birch trees stood at its shore’s edge, mixed among the others, the grass on the Hill was still green, with small patches of snow here and there, and the sky spread to the horizon. 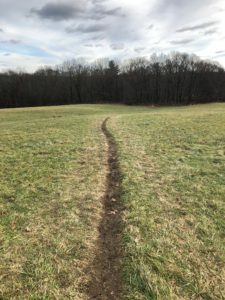 When it was time to go, I followed path markers into the woods at the top of the hill, at its’ highest point, enjoying the quiet of the woods, imagining, generations ago, my ancestors walking right there too. 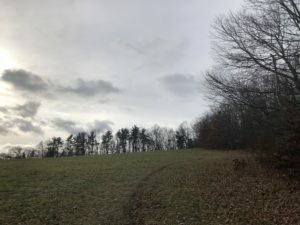 But as the path became less marked, which would connect to the trail below, and being alone, I decided to head the way I arrived, down the hilly meadow, to circle the lower path, just above the lake. I entered the wrought iron gate just as a school bus about a 1/4 mile away dropped middle grade or elementary students off, with the sound of the children laughing and happy to be dismissed. 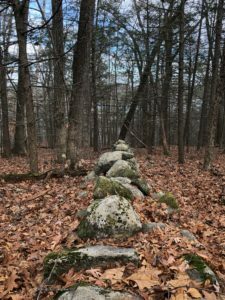 As I stood by the Osgood gravestones, the boys, wearing their backpacks, were soon hopping over the stone wall, cutting through the old, historic cemetery. I imagine, from the surprise of them seeing me, that it is a daily occurrence, one which I found beautiful and touching – the incongruence of life and death connecting, and a reminder that life goes on. I would say, in ending, that I now certainly have a better understanding of the terrible injustices of, mass hysteria and cruelty, and broad area besides Salem affected by the witchcraft movement, reminded of what I learned in middle or high school that I had forgotten. I look forward to researching. And in looking back at these numerous past generations, I am humbled by the experience. What I have discovered this past week and over the years, is that life, though different then and always changing, was still similar in so many ways and perhaps will always be. Walking awhile in my ancestors, their friends and neighbors footsteps helps me to find and appreciate my own, and others. It not only shapes me, but inspires me, and in general, keeps me learning. It gives me a sense of who I am, who came before me, and what I want to accomplish. Through the process and in life in general, I have found that some paths are smooth, others rough, some unmarked, many not straight. These stories above, and others, attest, paths can swerve. Change. End. And during our journey on the path of life, many people and places guide us, offering or giving direction, especially in our early years. When children, we often do not have the option of following which path we might choose for ourselves. As we grow older, we have more power of choice, though often time and/or commitments keep us going in one direction, often as if with blinders on. Yet at any given point, new paths might branch off, and in changing direction, for want or not, we may find, that along with the path, our very selves and souls widen too. Today, in thought, would truly see. By hills and valleys grandly flow. The waters of the fair Shawsheen. While joy and gladness light her eye. The hero noble, brave and free. For many a long and happy year. To spend her sweetest, happiest day. Of one who cheered and blest her home. Ere from the earth they passed away. Aglow with heaven’s unclouded light. Today are grouped beside her here. A brighter, happier home above. Note: Many thanks to my sister-in-law, Meridyth, who, also interested in genealogy and branching out our families’ Ancestry trees, is so helpful to me in learning more. I credit Meridyth for discovering Mary Clements Osgood. To Meridyth, I enjoy traveling this path with you! 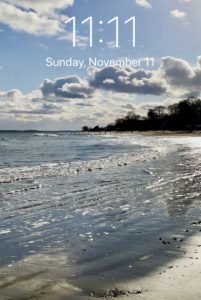 On Veteran’s Day, I looked at my iPhone to check the time. It happened to read 11:11 November 11. This time oddity caught my attention. The sight of three 11s at once seemed significant. I snapped a photo of my home screen, not knowing how long until the last second of the minute would pass and time would change. At first glance, the 11’s reminded me of the twin towers’. “Wow, the time was significant,” I thought, and felt it was a sign. Veterans Day, Western Europe and specifically, Germany, led me to thinking of different wars and times in addition to WWI and WWII, in other centuries, and events which sparked war, often by those who would later become war veterans. Many of these people, and of course I am not referring to those like Adolf Hitler or the like of him or any racist, but those fighting specifically against racism, initiated war, I believe, not because they wanted it but rather felt war was the last means to the freedoms they sought and believed right regarding governmental policies, equal Civil Rights, and religion. They fought in all ways to prevent physical fighting yet were not willing to relent, compromise or back down on important issues due to fear of themselves dying or losing all they loved. Specifically, one such circumstance, during the English Revolution of 1688 and 1689, during the Boston revolt in the ‘Dominion of New England,’ which, at the time included New Amsterdam (now New York City) on the night of June 2, 1689, supporters of England’s King James II were upon seizing Fort William (where official government documents and funds were held) to massacre their Dutch fellow-citizens, when an armed mob gathered to overthrow the existing government. Crying “Leisler,” the group rushed to the New Amsterdam home of my 8x great grandfather, Captain Jacob Leisler, a German born American colonist, the son of a Calvinist French Reformed minister. Leisler, eighteen years old at the time of immigration, and without his parents, had become a self made military captain, wealthy merchant and trader. He often aided – financially and emotionally – the same people that were then asking him to take control of the city and ultimately the entire province from appointees of King James II. Popular and probably the only wealthy resident in the province sympathizing with the Dutch lower classes (Leisler was often known to pay for the freedom of slaves from Africa and/or white people from elsewhere who had arrived to New Amsterdam who could not pay ship fees), Leisler was, within an hour, in possession of the keys of the fort, which had been seized. Four hundred of the new party signed an agreement to hold the fort “for the present Protestant power that reigns in England,” while ten people comprising a committee of the city freeholders assumed the powers of a provisional government, declaring Jacob Leisler in charge, commissioning him “captain of the fort” (today known as the Battery in Lower Manhattan). Thus began the period known as ‘Leisler’s Rebellion,’ in the midst of England’s Glorious Revolution. During the time of the Rebellion, a revolt reflecting colonial resentment against King James II, Leisler called the first Inter Colonial Congress in America and brokered the largest New York land deal to date for immigrant Huguenots to settle on while Colonel Nicholas Bayard, (the sixteenth mayor of the city and a man ironically a man related to Leisler through Peter Stuyvesant), escaped the city to avoid assassination. Just shortly before Leisler’s Rebellion, not far away from New Amsterdam, in Hartford, Connecticut, on the night of October 31, 1687, another ancestor of mine, Captain Joseph Wadsworth, according to the legend of the Charter Oak, spirited the Royal Charter of 1662 out of Sanford’s Tavern and the hold of Sir Edmund Andros, raced across the bridge over the Little River and hid it in the hollow of an ancient oak tree on the grounds of Samuel Wyllys’ home in Hartford. To many 19th-century defenders of the legend, the hiding of the Charter was a precursor for the later, more widespread, defense of colonial rights that led to the American Revolution and independence. It is telling that Hartford, Connecticut’s residents resisted the attempt by an agent of the British crown to illegally take their rights. Less than one hundred years later, on May 20, 1775, in opposition of England’s control, my 4th great grandfather, Joseph Vose, born and raised in Milton, Massachusetts, led a group of 60 men on a mission to burn a light house in Boston Harbor. He was later chosen Colonel of the 1st Massachusetts Regiment and became part of General George Washington’s staff, fighting beside Washington at the Battle of Yorktown. About the same time before the American Revolution, my 4th great grandfather, Colonel John Bayard, a delegate from Pennsylvania, who my grandfather, John Bayard Tracy, was named, was elected to the convention of Pennsylvania in July 1774, and re-elected in 1775. This group, originally the revolutionary counter to the official assembly, eventually replaced it as the legislature for the new government. When regiments were raised for the defense of Philadelphia in 1775, John became Colonel of the second regiment. In 1776, when the convention became a constitutional assembly, he was named to the Committee of Safety. In March 1777, he became a member of the state’s Board of War, and Speaker of the Pennsylvania Assembly, re-elected in 1778. In the meantime, the law firm he co-founded, Hedge & Bayard, became one of the firms under contract with the Continental Congress to supply the Continental Army. John himself fitted out a ship sent out as a privateer. But, in the fall of 1777, the British occupied Philadelphia. Bayard moved his family to a farm at Plymouth, Pennsylvania and took to the field with his regiment, which fought at the Battles of Brandywine, Germantown, and Princeton. 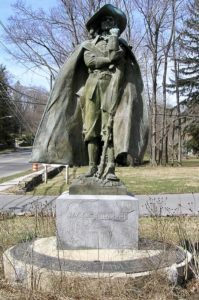 General Washington cited Colonel Bayard for his gallant leadership in the Battle of Princeton. In 1781, Bayard became head of the Board of War, and joined the state’s Executive Council. Under Pennsylvania’s 1776 Constitution this was a sort of combination of the roles of a governor’s cabinet and the state Senate. In 1785 Bayard was elected to the Congress of the Confederaton, the successor of the Continental Congress. He served in 1785 and 1786, attending their meetings in New York. 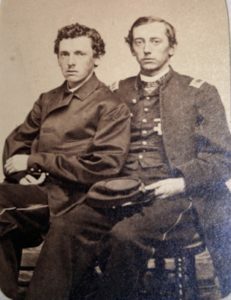 In the 20th century, my grandfather, John Bayard Tracy, thankfully did not serve in wartime but like his brothers, attended Culver Military School. During WWII, his youngest brother, Marine Colonel, Charles “Ted,” Sedgwick Tracy II, saw action at Saipan, Tinian and Iwo Jimo. A quartermaster, Ted was in charge of planning and getting supplies by boat to three marine divisions, landing on dangerous beaches and foreign land. For a job well done he was awarded the Legion of Merit. I recall my Uncle Ted with only a smile on his face and zest for life. He rarely spoke of his own war ordeal yet gladly spoke of the experiences of those ancestors who fought before him. 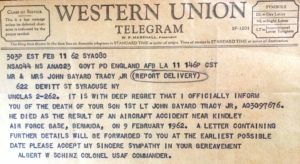 My grandmother and grandfather’s youngest son, John Bayard Tracy Jr., a lieutenant in the U.S. Air Force, who loved to fly, would go on to give his life for our country when, while co-piloting a plane on a SAC mission back from Russia during the Cold War on February 9, 1962, it exploded, killing him and all other six men on board, their bodies never able to be recovered. I consider my Uncle John and all those on board that fateful day veterans of war and am very proud of their passion and service. On each Veterans Day while I was growing up, I recall my parents and grandparents honoring the day, by speaking of it and bringing plants and flags to the cemetery. I have always enjoyed attending ceremonies and parades in honor of those living war veterans and those deceased. It is important for veterans to see that they are not forgotten, that their services in wartime to our country and our freedoms were not in vain. I hope that I have instilled in my three sons that whenever they see a veteran with a hat on to thank them for their service. Shake their hand. Talk to them. Get to know them and a bit about their service if they so allow. And of course it is not only living veterans and/or those veterans killed in action that deserve recognition. It is their family – spouses, parents, children, grandchildren – and friends, affected by the sacrifice that service men and women made and make, leaving their homes, those they love and love them, and especially, of course, those that never came home. I am grateful this Veterans Day and Thanksgiving for the generations of those veterans that fought and protected the freedoms we have today in our country and pray that the many battles of days and wars before, in both war time and that leading up to war – in fighting ground to ground, face to face, air to air – today and moving forward will be with the use of words and a shake of the hands. “We meet today, the veteran survivors, to commemorate the most notable events of our lives; the noblest acts of our career; to recount the dangers that we have passed; to relate our former triumphs won, and to mourn for our heroes fallen. We have all borne our part in the heat and burden of the day of strife. We have all endured the long and weary, dusty march; we have dropped to earth almost too tired to rise again; we have shivered through the night in the cold and wet bivouac, and frequently suffered the real pangs of hunger and thirst. To us all the sharp ring of a rebel bullet has been a familiar sound, as well as the dull and sickening thud that announced the bullet had reached its mark; the very earth has sometimes trembled under our feet from the discharges of musketry and artillery; we have known the despair of defeat and felt the blood pounding through our veins as we joined in the surging wave of victory. Once more, sometimes as a strain of martial music strikes the ear, or a discharge of cannon is heard, a vision arises before us of other summers, of fields of yellow grain and tangled forests; once more we see the serried lines of gray and blue, we hear the shriek of the shell and the yell of the rebel charging column, and once again the tragedy of violent and immediate death of well-beloved comrades is enacted before our eyes. We shall never cease to feel a thrill of pride so long as we continue to breathe, that in the morning of our lives, when everything was at its brightest and its best, when the dew was on the flower and the night was on the wave, when life was still “the roses hope while yet unknown,” that we were willing to sacrifice it all for the love of our common country. That we were willing to give up the full pleasures of this world which we had just begun to experience as men, to throw down our work, to destroy the careers we had marked out for ourselves, and all for no other purpose than to preserve intact the nation that gave us birth.